Old map by BRITISH ADMIRALTY CHART. - Africa east coast Delagoa Bay (Lorenzo Marques) surveyed by Captain WFW Owen and the officers of HMS Leven and Barracouta 1822-5. . . Title: Africa east coast Delagoa Bay (Lorenzo Marques) surveyed by Captain WFW Owen and the officers of HMS Leven and Barracouta 1822-5. . . Size: 39.0 x 27.6 inches. Condition: Paper slightly age-toned as usual. Two sheets joined, map enlarged with a small piece of paper at right part. 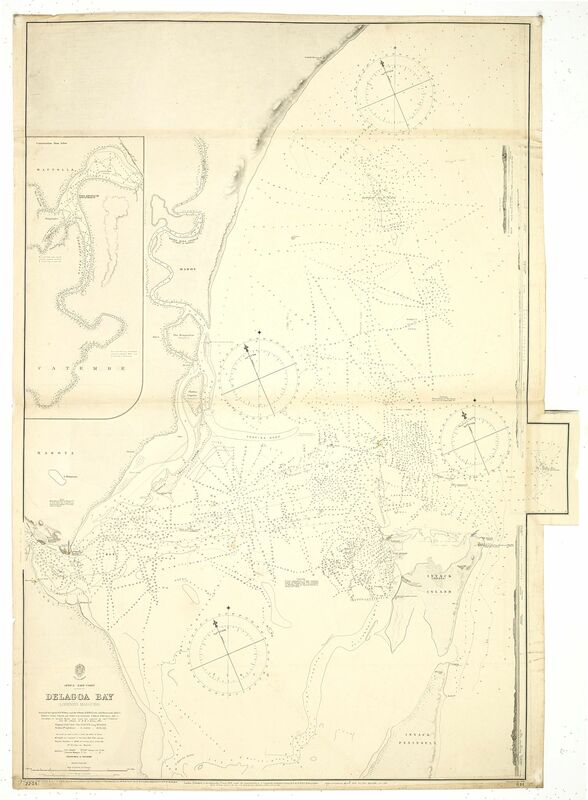 A fine Hydrographic Office chart no.644 (2205), showing Africa's east coast with Delagoa Bay (Lorenzo Marques) surveyed by Captain WFW Owen and the officers of HMS Leven and Barracouta 1822-5". The chart is corrected with magnetic variation in 1900, decreasing about 2' annually". With one inset : continuation of English River and 3 coast profiles. Good detail on Delagoa Bay (Maputo Bay). Engraved by Edw.d Weller. London : Published at the Admiralty 1st June 1882 under the Superintendence of Captain Sir Frederick J. Evans, Hydrographer : Sold by J.D. Potter agent for the Admiralty charts, 31 Poultry & 11 King Street, Tower Hill".